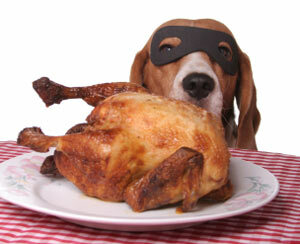 Is it safe for your dog to eat Chicken? Read more to find out. There is a reason that dog’s are known as man’s best friend. The loyalty and company they provide have shown to not only mentally help individuals out with issues such as depression and loneliness, but physically as well, thanks in part to the energy they display and the effort it takes to love and care for these pets. So it goes without saying that they it is only fair to make sure we keep them as healthy as they keep us. One of the best ways is knowing what is good and not good for these companions stomachs. Chicken is undoubtedly one of the most loved foods by human beings all over the world. It only seems logical that our canine companions would love this food too, but is it healthy for a dog’s diet to eat it? As it turns out dog’s can eat plain cooked chicken breasts and not have to worry about it harming them. However, raw chicken is not healthy as the salmonella contained in it can not only cause harm to the animal but to any individuals who are licked by the dog, resulting in the salmonella being transferred to them as well. It is important to remember however that feeding canines only cooked chicken breasts will cause deficiencies with important nutrients that the animal needs. So while chicken is fine for a dog’s diet, it is not all that a dog needs. What do other dog owners have to say about whether their dogs can eat Chicken or not? See comments below. Know if dogs can or can't eat Chicken? Help other dog owners by leaving a comment.